One of the hottest trends in international music today is the resurgence of Klezmer, which features the soulful and exhilarating melodies of Eastern Europe. 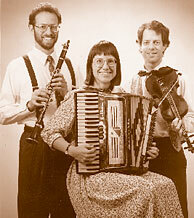 Atlanta-based Oy Klezmer! is acclaimed throughout the Southeast for its authentic presentation of this distinctive folk genre which is spiced with Gypsy influences. Oy Klezmer! performances hearken back to the days of the original Klezmorim, professional itinerant Jewish musicians who played at festive occasions of Jewish and Christian communities across Europe. Oy Klezmer! 's full concert ensemble features singer Mrs. Schmaltz with a quintet comprised of clarinet, violin, accordion, tuba/bass and drums. The Oy Klezmer! instrumental trio or quartet, with or without the sensational Mrs. Schmaltz, also makes frequent appearances. These flexible Oy Klezmer! ensembles can range from a high-energy Klezmer dance band to a small group providing background music for an elegant affair. Oy Klezmer! 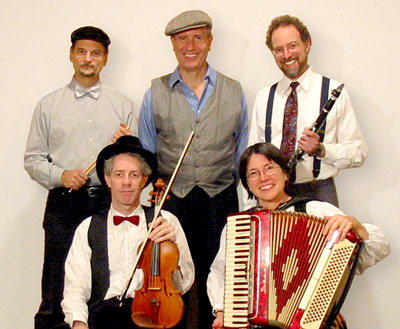 has been featured at concerts, festivals, weddings, bar-mitzvahs, anniversary parties and educational programs, earning enthusiastic praise, particularly from the old-timers who grew up hearing Klezmer in the "old country." The group formed in 1993, because of an old collection of wedding tunes from Moldova (now Romania) founder and clarinetist Laurence Sherr gleaned during his doctoral studies at the University of Illinois. He caught the Klezmer bug and, once home in Atlanta, recruited the other two original members, violinist Chip Epsten and accordionist Susan Clearman. Since all three are also composers, they put those skills to work as they designed the arrangements to explore the tonal personalities of each instrument. They play individually, then in various combinations, sometimes in improvisatory "flex-time," and at others with seemingly reckless abandon. Oy Klezmer! has expanded its repertoire to include dance tunes from all over Eastern Europe, Israeli, Yiddish and Ladino folk tunes, Klezmer influenced swing and Yiddish theater songs, Hasidic music, and favorites from the Klezmer masters such as Giora Feidman, Dave Tarras, and Abe Schwarz.